Identification: The Japanese honeysuckle is a semi-evergreen (in northern locales) or evergreen (in southern locales) vine that grows by twisting around vertical structures. Flowers are tubular, white or pink, turn yellow with age, and bloom in April to August, sometimes through October. Children love the flower nectar and everyone catches the sweet fragrance. Seeds are small, oval, and ripen to black from September to November. Leaves are oval, sometimes lobed, and are opposite and separate. Fine soft hairs cover the leaves and stems. The leaf is a good way to distinguish the Japanese honeysuckle from native species, whose leaves are hairless and united to form a single leaf around the also hairless stem. 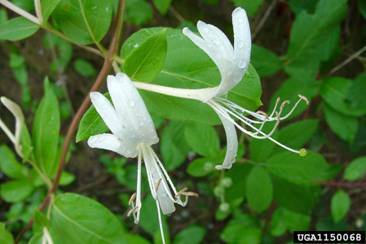 Japanese honeysuckle spreads both sexually through seeds and vegetatively through underground rhizomes and aboveground runners. This shade and drought tolerant species takes hold as dense undergrowth under canopies and can reach high as high as 24cm (80 ft). Growth slows in severe cold and low precipitation regions. Current Distribution: North America: fields, forests, wetlands, barrens, and all types of disturbed lands in the eastern and southern US. Its distribution is limited by the Pacific northwest and the northern states because of cold. Site and Date of Introduction: Introduced in 1806 in Long Island, NY. The similar but more aggressive variety halliana was introduced in 1862 in Flushing, NY. Mode(s) of Introduction: Introduced as horticultural ground-cover. Initially growth was low-key, and the plants became established in eastern US only by early 1900s when it escaped cultivation. Reason(s) Why it has Become Established: 1. Few natural enemies. In its native Japan, the species has several natural enemies such as the honeysuckle aphid. But in North America, the plant grows almost unchecked. 2. Blooms exuberantly, especially in full sun, and produce abundant animal-dispersed seeds. 3. As a perennial, it grows when other plants are dormant. Ecological Role: Mostly occurring as invasive species. Also used as ornamentals. Benefit(s): Wildlife managers have used the Japanese honeysuckle as winter forage, especially for the deer. Highway designers sometimes use the plant for erosion control and bank stabilization. It is also a Chinese medicine herb prescribed to calm “liver fire”, which is believed to cause skin conditions such as chicken pox or acne. Studies have shown the plant to have antibiotic and antiviral properties comparable to those of antibiotics. I have tried it as a tea and found it to be effective against skin blemishes. Threat(s): Primarily habitat destruction through changed forest structure. Growing aggressively, the Japanese honeysuckle girdles young trees and shrubs and cut off their water supply. 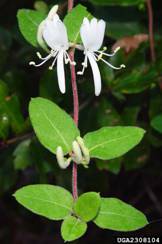 By spreading runners, the Japanese honeysuckle builds dense mats that blocks sunlight, gradually killing everything below. Its dense growth can topple trees by weight alone. The plant also competes vigorously for root resources and squeezes out other vegetation. 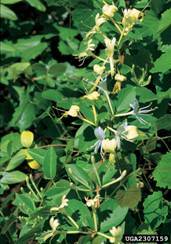 Once established, the Japanese honeysuckle smothers the native flora on forest floors and is difficult to control. Control Level Diagnosis: High. Listed as noxious weed in Connecticut, New Hampshire, and Vermont. Control Method: Small areas: in July to October, hand pull seedlings, apply herbicide on leaves, or cut just above the soil surface and apply herbicide on freshly cut stem. Large areas: prescribed burning in spring, because mowing or graving might cause it to grow back denser.